Critics said this didn't show the usual level of respect for a public figure of Mr McCain's stature. So President Donald Trump appeared to change his mind. He issued a proclamation and the flag is once again at half mast.But what are the rules when it comes to marking major public figures in this way? Under the United States Code, when a president or former president dies, the flag should be flown at half mast above federal buildings for 30 days. Had Mr McCain beaten Barack Obama in the 2008 election, he would automatically have been accorded this honour.Following the death of a vice-president, the chief justice or a retired chief justice, a state governor, or the speaker of the House of Representatives the length of time flags should fly at half mast falls to 10 days. For a member of Congress like Mr McCain, who was a senator for Arizona from 1987, the flag need only be flown at half mast on the day of their death and the next day. 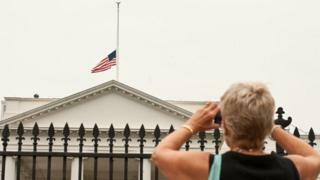 So, the White House didn't break the rules, as Mr McCain died on Saturday and the flag was raised to its full height on Monday. But the president's executive powers allow him to override the rules for figures considered to deserve a longer-lasting display of respect.When long-serving Senator Edward Kennedy died in 2009, President Barack Obama issued a proclamation stating that the flag would fly at half mast until sunset on the day of his burial. This happened again when former astronaut and Senator John Glenn died in 2016.Mr Trump has now repeated this honour for Mr McCain, saying this recognised the "longstanding service" he had given.The president can also decide to give this mark of respect for leading figures in national life, whether political or non-political.In February, Mr Trump did so for the preacher Billy Graham, after he died aged 99. And, in April, he did so again for former First Lady Barbara Bush, describing her as "an outstanding and memorable woman of character".Mr McCain will be laid to rest on Sunday, following a funeral ceremony at the National Cathedral on Saturday. Mr Trump, with whom he clashed on several occasions, has confirmed he will not attend.